Sometimes you hear a song and you just know it’s special, it resonates with you and you can’t get that song out of your head. For up-and-coming Country star Tyler Rich that song is "The Difference." 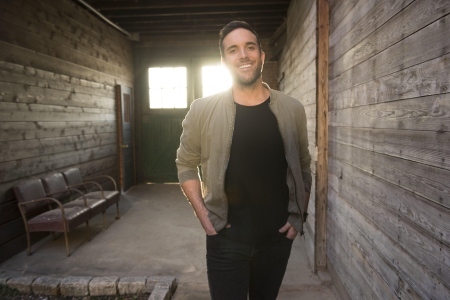 A prolific songwriter who estimates he’s written a hundred songs in the last year, Tyler explains it was love at first listen when he heard the Rhett Atkins-penned "The Difference" during a pitch meeting. "We’ll do these five-hour pitch meetings where a publisher will walk in and everybody gets 30 minutes. They’ll play ten songs they think are the best for you. That one was hour three and a half, the little guitar riff started and just immediately the kind of swag and the delivery of the melody and the vocal, I was instantly hooked," he recalls. "For an outside song, I have to hear it and immediately be like, ‘Oh yeah, this sounds like I wrote it, this feels like me.’ It was pretty cool to find out a legend like Rhett wrote this one with Ben Burgess and some Northern California boys like me – Devin Dawson and Jacob Durrett." Tyler is still kicking himself for not writing the lyrically profound and musically infectious tune about appreciating and showing the one you love how much they mean to you. "My fiancée and I live in a texting relationship cause we’re long distance. If I’m like, ‘I’m gonna call you in two hours, love you,’ she goes, ‘Love you? You mean I love you? There’s a difference between I love you and love you,’" he says smiling. "She’ll always say that to me so then when I heard ‘The Difference,’ it’s like, ‘Why didn’t I come up with this idea?’ It’s perfect; I’m pumped it’s the first single." His immediate belief in the song has been rewarded with just as urgent praise. Already lauded as a coveted chart-topping SiriusXM Highway Find, "The Difference" is an anchor that also landed Tyler as a CMT Listen Up artist for 2018, a slot on Brett Young’s CMT ON TOUR: HERE TONIGHT and a Pandora's Artist to Watch for 2019. Tyler made his national television debut on NBC’s TODAY performing the Country radio Top 25-and-rising single, which has crossed over 44 million streams to date. For the Yuba City (small farming community near Sacramento) native who splits his time between Nashville and Los Angeles, where his fiancée lives, "The Difference" is his long-awaited introduction to Country radio – a moment he’s been working towards since first playing various genres with his band in high school. While grinding on the road in the early days, Tyler also kept a steady gig at Red Robin where he rose up the corporate food chain. Becoming some of his first fans, Red Robin gave Tyler and his band members all-you-can-eat gift cards so they wouldn’t starve while struggling to make it big. "My first concert was George Strait at Arco Arena in Sacramento when I was eight. My mom was big into Country, so when I was riding around with my mom in the car it was Clint Black, Vince Gill, Garth, George," he recalls. "My dad would listen to Tom Petty, Creedence, Pat Benatar so it’s cool to have both of those influences in my sounds now." Music is part of Tyler’s bloodline. "My uncle would play at these holiday parties, any get togethers we ever had with our family. He and his friends would get their guitars and just play cover songs," he says. "I told my grandma I need to be a part of this, I need a guitar. So, for Christmas, when I was 14, she bought me a guitar and then my uncle and my buddy taught me to play a couple of songs so I was just jamming." Growing up around all styles of music – the first four songs Tyler learned on guitar were Ben E. King’s "Stand My Me," Garth Brooks’ "Friends In Low Places" and songs from Blink 182 and Metallica – he was comfortable in multiple genres, which led to years of covering songs and writing Pop songs. But when given the opportunity four years ago to be a solo artist he knew it was finally time to explore his Country side. "I said, ‘If I’m gonna be a solo artist I want to explore Country,’" he recalls. "I was in Santa Monica sitting with these two guys from Giant Lion Productions - who I still write with today - Mike Mac and Jordan Baum, and they were like, ‘Show me what you got.’ I played them three half songs I had written and they said, ‘This is all you’re ever allowed to do. If anybody ever told you differently they’re stupid and they’re wrong. This is the only thing you’re ever allowed to do and we hope you’ll do it with us.’"
Tyler began testing his Country music chops online where he gained a huge following. One of his biggest fans included another hot Country newcomer, Dustin Lynch, who saw him singing his hit song "Mind Reader" on Instagram before inviting Tyler to Nashville for a meeting. That lead Tyler to a management deal and the momentum hasn’t stopped. Shortly thereafter he made the permanent move to Nashville. For Tyler it was another gut instinct call. But those have been paying off for him for years, like the six-figure job he turned down straight out of college to give music a final try. Enlisting Tyler as one of their 10 New Country Artists You Need to Know, Rolling Stone touted him as "the newest member of country music’s radio-minded incoming class, with a homecoming king’s swagger and a valedictorian’s songwriting smarts." "I went back to college, graduated, I have a bachelor’s in Economics and got a job offer from a financial investor. I graduated with honors, not because I’m smart, but because I tried really hard to impress my grandma. I promised her I would get my degree," he says. "It was crazy because as a poor college student with a ton of debt now I was offered this prestigious job. I sat there and I politely declined. I promised myself when I graduated I was gonna go back to L.A. and give it another shot." His faith in his music is being rewarded with a hot new single that is set to finally bring him the career he wants and credit as a writer on Backstreet Boys AJ McLean’s new single, "Night Visions." And Tyler wants it all. "This is our key to the door that opens everything," he says. "Writing and listening to songs this last year with my team, we really narrowed down what we believed that perfect song was going to be to launch this. And when I say launch it’s because our plan is to reach the top. We want to play stadiums. We think this song will be the one that does it."